SMITH , Joseph Jr. (1805-1844). was an American religious leader and founder of Mormonism and the Latter Day Saint movement. When he was 24, Smith published the Book of Mormon. By the time of his death, 14 years later, he had attracted tens of thousands of followers and founded a religion that continues to the present.. 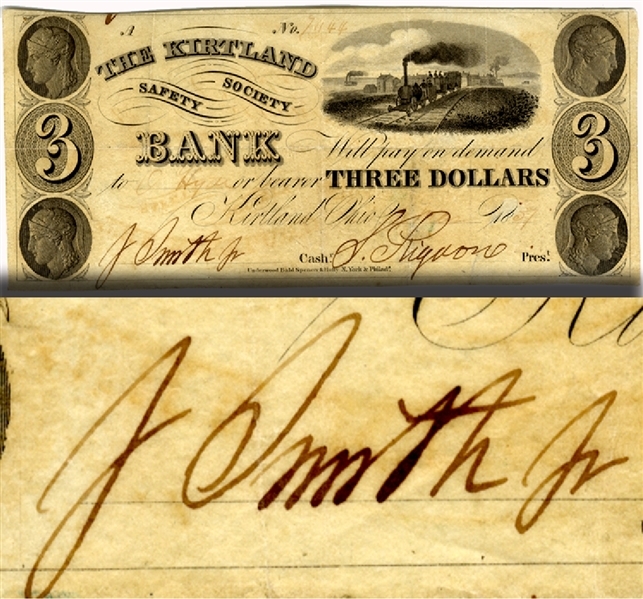 Partially printed bank note signed "J Smith Jr," approximately 7 x 3 in., 1837. This rare Mormon bank note is in the denomination of $3 issued from Kirtland, Ohio. Printed on bond paper. Engraved by Underwood Bald Spencer & Hufty, New York & Philadelphia, 1837. Title "The Kirtland Safety Society Bank" appears next to an illustration of an early locomotive and rail cars with an industrial port town in the background. Each of the four corners of the note features a classical profile while the numeral "3" flanks both the far right and far left side of the note. The bottom of the note features the signatures "J Smith Jr" as Cashier and "S. Rigdon" as President. Serial number is handwritten on top along with name of individual to whom the note is written, however, these are faded to the extent as to be illegible. The Kirtland Safety Society Bank was founded to serve the financial needs of the growing Mormon community in Northeast Ohio. The bank was refused a charter by the Ohio legislature in the winter of 1837, and shortly thereafter collapsed. A tumultuous period ensued in which some Mormons suspected Smith of using the bank for his own personal gain, other Mormons fled West due to increasing anti-Mormon sentiment, and Joseph Smith, Jr., himself was charged with illegal banking and printing unauthorized bank notes.